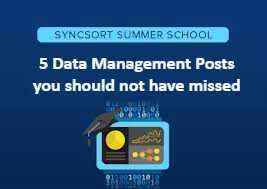 Over the US summer our partner, Syncsort, published a number of posts reviewing data governance, data quality and big data that made good reading, both for the beginner and for the expert looking to keep up with emerging trends. If that doesn’t keep you busy then the following three posts link nicely to show the relationship- between analytics, data quality and data governance. In Keeping Track of Customer Demand, Christopher Tozzi explores how big data can be used to understand the customer. Christopher uses practical examples to show how real time analytics helps marketing to keep in touch with customers changing preferences for interaction, which in turn allows the business to respond more effectively to both market to and service customers. The post discusses th importance of the 360 degree view of the customer for effective analysis, which in turn requires quality customer data. In A Data Quality Study Guide, Jamie heckler examines a number of use cases and trends that you may find useful in examining your own approach to delivering quality data. The post examines the link between data quality and cost savings, looks at why quality data is essential for trusted BI, and looks at the impact of improved customer data quality on the customer experience, along with a number of other trending topics. The report also touches on the link between data quality and data governance which leads nicely in to the next post. Finally, in A Data Governance Review, Jamie Heckler extends the previous article to examine the relevance of data governance to delivering trusted data. Ultimately, data quality depends on fitness for purpose, representational effectiveness and data knowledge. The post looks at how data governance in the Hadoop environment is critical to avoid the data lake becoming a data swamp. ← Are you ready to manage your own data breach?